The Province o Livorno or Leghorn (Italian: Provincia di Livorno) is a province in the Tuscany region o Italy. It includes several islands o the Tuscan Airchipelago, includin Elba an Capraia. Its caipital is the ceety o Livorno. It haes an aurie o 1,218 km², an a total population o 326,444 (2001). 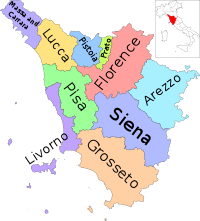 There are 20 comuni (singular: comune) in the province .